If you are looking for bridal lehenga shops in Burrabazar Kolkata, then you have come just to the right place. To help you buy the best bridal lehenga in Kolkata, I have curated a list of 10 lehenga shops in Burrabazar Kolkata where you can find your dream lehenga in every budget. A trusted name among shoppers in Kolkata, Shree Saree Kunj is one of the best bridal lehenga shops in Burrabazar Kolkata. Here you can find a wide range of bridal lehengas, wedding gowns and sarees for your wedding shopping. Store Timings: Monday - Sunday 11 a.m. to 9 p.m.
2. Nav Durga Creation Pvt. Ltd. Image Source: Nav Durga Creation Pvt. Ltd.
Nav Durga Creations is a one-stop shop for all your bridal shopping in Kolkata. Right from bridal lehengas to sarees, Nav Durga Creations is one of the preferred lehenga shops in Burrabazar Kolkata for everything bridal. With a wide lehenga collection in Kolkata, Shree Gopal Shyam Sundar is a go-to place in Burrabazar. Drop in to check out their bridal collection and be rest assured that you will find something that matches you style as well as budget. Store Timings: Monday - Sunday 11 a.m. to 8 p.m.
Panghat in Burrabazar probably has one of the best lehenga collection in Kolkata with price that is affordable. Their collection is contemporary and designed with the 21-st century bride in mind. Store Timings: Monday - Sunday 10.30 a.m. to 9 p.m.
All you brides who want to buy a bridal lehenga in Kolkata should definitely visit Aachal Textiles. This lehenga shop in Kolkata has beautiful bridal lehenga collections as well as sarees for those who want to have a complete wedding shopping experience under one roof. Store Timings: Monday - Sunday 10.00 a.m. to 10 p.m. This bridal lehenga shop in Burrabazar Kolkata has some beautiful lehenga designs that you can check out to buy for your big day. They also have beautiful sarees that you can have a look at and buy for your other wedding functions! Store Timings: Monday - Sunday 10.30 a.m. to 8.30 p.m.
Head to Neelkamal if you are looking to buy modern bridal lehenga in Kolkata with price that’s not too high on the pocket. 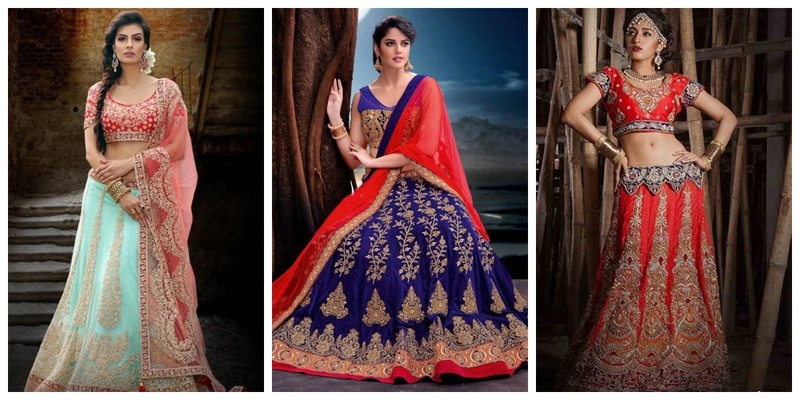 They have a wide range of lehengas in all budgets for you to choose from. Store Timings: Monday - Saturday 10.30 a.m. to 8 p.m.
Roop Samrat Creations is one of those lehenga shops in Kolkata where you will find heavy bridal lehengas, sarees and suits. Their bridal lehenga collection is huge, has many colours and is available in lots of designs and modern patterns. Sundari Saree Emporium on Chittaranjan Ave is a go-to destination for lehenga shopping in Burrabazar Kolkata. They also have semi-stitch lehengas for brides who prefer to get their lehengas tailor made according to their liking. If you are checking out bridal lehenga in Kolkata with price, then do visit Astha Sarees here, to have a look at their collection. Astha has modern as well as traditional bridal lehenga designs, which you can choose according to your taste and budget. Store Timings: Monday - Saturday 10.30 a.m. to 8:30 p.m. So, which lehenga shop in Burrabazar is on your list for wedding shopping in Kolkatta?